Welcome to Bake A Building 2018! 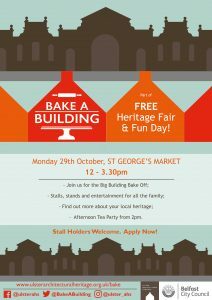 Ulster Architectural Heritage and Food NI invite you to **BAKE A BUILDING** for the Big Building Bake Off at St. George’s Market, 29th October 12-3pm. Forget that Bake off, this is a Building Bake Off! Open to all – professionals, amateurs, kids, school groups and organisations- we are asking you to choose your favourite historic building, and BAKE! Judging by celebrity chefs: BBC’s Paula McIntyre, Jane Allen, Jane’s Kitchen & Finbar Haughey, Andrew Ingredients. Prizes from Food NI, Merchant Hotel, James Street South, Andrew Ingredients, Ditty’s Bakery, National Trust, Waterstones, Craftsy and Ulster Architectural Heritage. 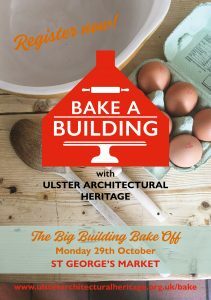 Entries will be judged at ‘The Big Building Bake Off’, St. George’s Market Belfast on 29th October. To enter, competitors must choose a building from the list below or propose a heritage building that you would love to bake and register with Ulster Architectural Heritage by 5pm on 19th October 2018. Judging will take place on 29th October 2018 at St. George’s Market, Belfast, from 12pm. If there is a heritage building you would like to bake that is not on the list below email us at: [email protected] to get it included! Bake a Building is part of a bigger UAH Heritage Fair & Family Fun Day! All are invited to see the bakes, and celebrate with the participants at a Tea Party from 2pm on 29th October at St. George’s Market, Belfast. Stalls, stands, entertainment for all the family from 12pm-3.30pm. To register, please choose the historic building you wish to bake, and complete the online form here. Registration has now closed. Not a baker? All welcome at the FREE Heritage Fair & Fun Day on 29th October. We are welcoming applications from Stall Holders, those selling NI made food, goods and crafts, for a fee of £10. Apply here. We are inviting NGO/Community Heritage Organisations to take a free stand at the event. Apply here. All Welcome. General Admission FREE, No booking required. 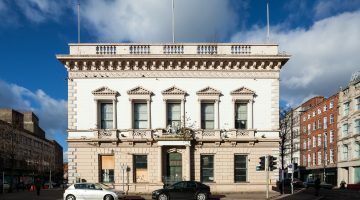 As we are celebrating the architectural heritage of Ulster, it is important that buildings are chosen which are of architectural and historical merit and which retain their original character. We have selected buildings from Belfast and across Ulster which showcase our fantastic built heritage. We are keen for competitors to create as many different buildings as possible, so once a building has been registered we cannot accept further entries for that building. If there is a building which you are passionate about baking which does not appear on the list, you can contact us to enquire if it would be eligible. To register, please complete the online form here. Full terms and conditions of entry can be found here: Bake A Building Terms and Conditions.